Day 27: Favorite herb or spice? You’d think this prompt would inspire my typical “BUT I CAN’T CHOOSE A FAVORITE!” panic, but it doesn’t! Happily, one spice pushed its way forward without me even giving the question much thought: cumin! I love cumin because of its versatility. It pairs well with so many other spices, and it’s an essential component of lots of flavor profiles. Just imagine taco seasoning or a curry paste without cumin — it’s too crazy to contemplate (regional variants notwithstanding)! A quick search of my blog using the “cumin” keyword reveals lots of mentions throughout the years; I guess I chose wisely! 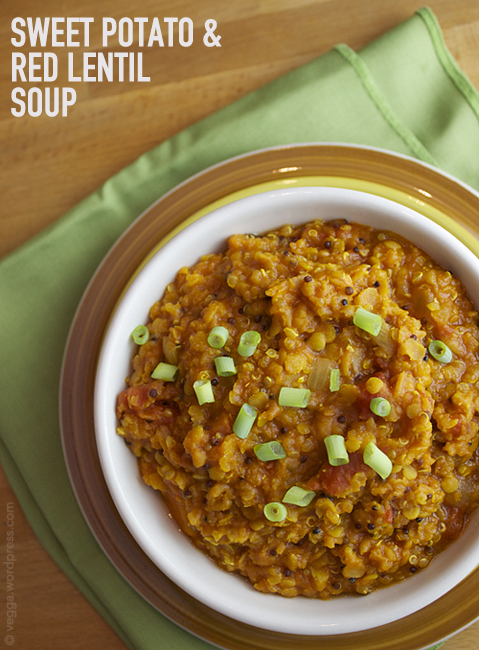 For example, this red lentil soup wouldn’t be the same without cumin. Hmm… I should’ve called that a stew, not a soup! It’s so thick. Delicious either way, though. Now if you’ll excuse me, I’ve got to figure out a way to incorporate cumin into tonight’s dinner! Cumin is a bit of a stealth favourite in my house – I go through it faster than any other spice or herb, yet I never even considered it for this question. I must take it for granted! yes! Cumin for president!! Mexican, Indian, Ethiopian… cumin is always good! It’s definitely the #1 most-used dried spice in our kitchen. I love it so much.